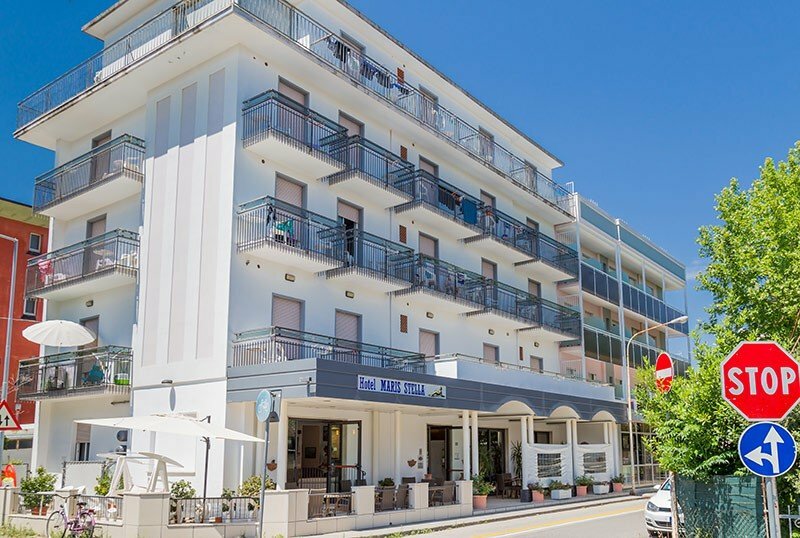 In a quiet area near the beach, the Hotel Maris Stella in Riccione is a 2-star hotel with air conditioning in the common areas and in the rooms, home cooking, parking, WI-FI and playground area. Offers free entry and transportation to the Beach Village water park. The hotel is located in the north of Riccione, a quiet and peaceful area just 3 minutes walk from the beach and promenade. Also close to the premises of the Marano area, which can be reached on foot in less than 10 minutes. Rimini Federico Fellini Airport is 3 km from the property. All hotel rooms are equipped with WI-FI, TV, telephone and private bathroom with shower, hairdryer and complimentary toiletries. Most rooms also have a balcony and air conditioning. FAMILY: family solutions are available for families and groups. Equipped open-air porch, children's playground area outside, lift, night porter, luggage storage service and valuables deposit (at the reception). Organize aperitifs and evenings with live music. PARKING: fenced and available 50 meters from the hotel, subject to charges. AIR CONDITIONING: in the common areas and, on request, available in 16 rooms. CONVENTIONS: beach, organized excursions and free entry to the Beach Village water park. BREAKFAST: buffet with both sweet and savory dishes, as well as drinks, juices and coffee. LUNCH AND DINNER: there are two menus, one of meat and one of fish, buffet of appetizers and vegetables, to enjoy the best recipes of the Romagna tradition. VARIATIONS: upon request the kitchen prepares gluten-free dishes. OTHER: the staff organizes an aperitif every Thursday for lunch and the gastronomic evening with Paella every Friday. In the hotel: fenced playground. In the room: cot and cots with side rails. At meals: high chairs at the table, dedicated menus and baby food on request. On the beach: playground area, entertainment and mini-baby-junior club. There are two beaches that have an agreement with the hotel: Bagno 127 and Marano Beach, of which the latter is equipped with heated swimming pools, hydromassages, relaxation paths, sports fields, gym, games, parties and entertainment. The prices of the price list are for a stay NOT Less than 5 days. Spend the first summer holidays with us and save money thanks to our offers for the beginning of June. From 2 to 16 June, 7 days in full board from € 227.00 per person. The offer can not be combined.